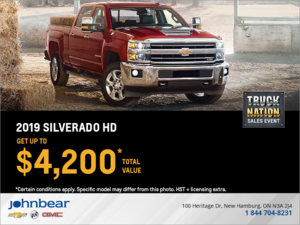 Get up to $4,200 total value on the 2019 Chevrolet Silverado HD! 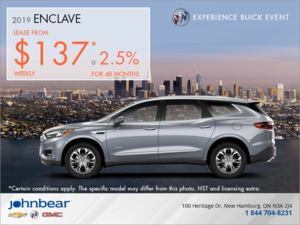 This offer ends on April 1st, 2019. 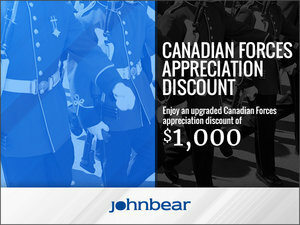 I wish to receive recalls, news and promotional emails from John Bear New Hamburg. 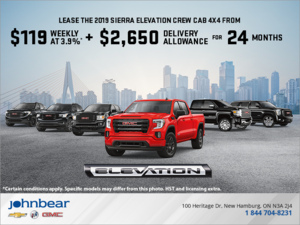 40 Offer available to qualified retail customers in Canada on select vehicles delivered from March 1 and April 1, 2019. 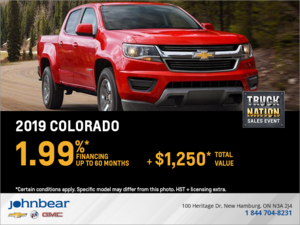 1.99% purchase financing (1.99% APR) offered on approved credit by TD Auto Finance Services, Scotiabank® or RBC Royal Bank for 60 months on eligible new 2019 Colorado models (excludes 2SA). Participating lenders are subject to change. Rates from other lenders will vary. Down payment, trade and/or security deposit may be required. Monthly payment and cost of borrowing will vary depending on amount borrowed and down payment/trade. Example: $42,640 financed at 1.99% nominal rate (1.99% APR) equals $747 monthly for 60 months. The offer includes $1,250 Cash Delivery Allowance (tax exclusive). Cost of borrowing is $2,192, for a total obligation of $44,832. Freight ($1,895) and air conditioning charge ($100, if applicable) included. 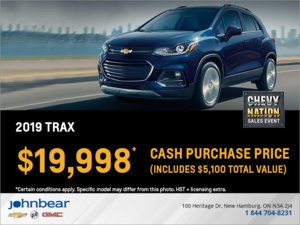 License, insurance, registration, PPSA, applicable taxes and, except in Quebec, dealer fees not included (all of which may vary by dealer and region). Credits vary by model. Dealers are free to set individual prices. Limited time offer which may not be combined with certain other offers. General Motors of Canada Company (GM Canada) may modify, extend or terminate offers for any reason, in whole or in part, at any time, without notice. Conditions and limitations apply. See dealer for details. 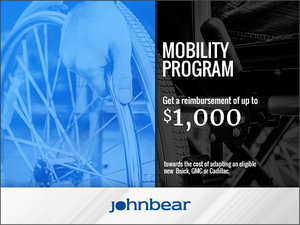 As part of the transaction, dealer may request documentation and contact GM Canada to verify eligibility. These offers may not be redeemed for cash and may not be combined with certain other consumer incentives. Conditions and limitations apply. Void where prohibited. See Dealer for full program details. ®Registered trademark of The Bank of Nova Scotia. RBC and Royal Bank are registered trademarks of Royal Bank of Canada. TD Auto Finance is a registered trademark of The Toronto-Dominion Bank. 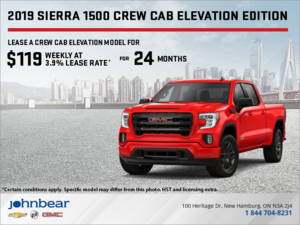 45 Offer available to qualified retail customers in Canada for vehicles purchased and delivered between March 1 and April 1, 2019. 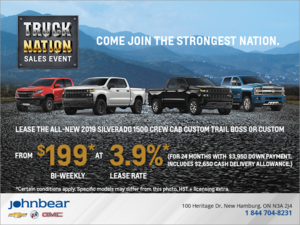 Lease based on suggested retail price of $50,640, includes $2,650 Cash Delivery Allowance (tax exclusive) and $1,325 Dealer to Consumer Credit (tax exclusive) towards the lease of an eligible 2019 All-New Silverado 1500 Crew Cab Custom or Crew Cab Custom Trail Boss model. 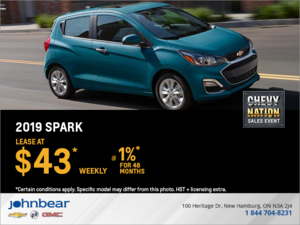 Bi-weekly payment is $219 for 36 months at 3.9% lease rate (3.9% APR) on approved credit to qualified retail customers by GM Financial. The $109 weekly payment is calculated by dividing the bi-weekly payments. Payments cannot be made on a weekly basis. Equivalent weekly payments are for informational purposes only. Annual kilometer limit of 20,000 km, $0.16 per excess kilometer. $3,500 down payment required. Payment may vary depending on down payment trade. Total obligation is $20,563. Freight ($1,895) and air conditioning charge ($100, if applicable) included. Taxes, license, insurance, registration and applicable fees, levies, duties and, except in Quebec, dealer fees (all of which may vary by dealer and region) are extra. Option to purchase at lease end is $30,384. See dealer for details. Credits vary by model. Dealer may sell for less. Factory order may be required. Limited time offer which may not be combined with certain other offers. General Motors of Canada Company may modify, extend or terminate offers in whole or in part at any time without notice. Conditions and limitations apply. Offers may not be redeemed for cash and may not be combined with certain other consumer incentives. 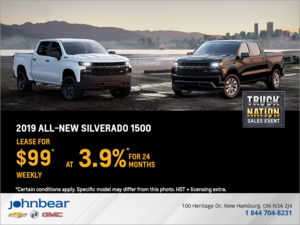 46 Eligible 2019 All-New Silverado 1500 Crew Cab Custom of Custom Trail Boss. 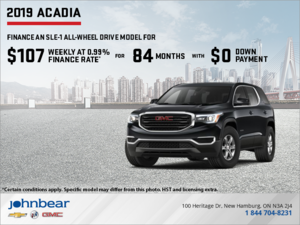 Offer available to qualified retail customers in Canada for vehicles financed and delivered between March 1 and April 1, 2019. Financing provided, on approved credit, by TD Auto Finance Services, Scotiabank® or RBC Royal Bank. Participating lenders are subject to change. Rates from other lenders will vary. 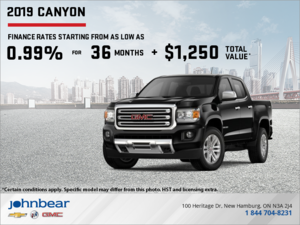 Representative finance example based on a new 2019 All-New Silverado 1500 Crew Cab Custom of Custom Trail Boss. Suggested retail price is $50,640. $3,500 down payment required. 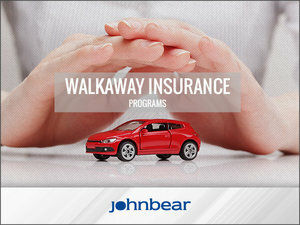 $42,815 financed at 3.99% finance rate (3.99% APR) equals a weekly payment of $124 for 84 months. 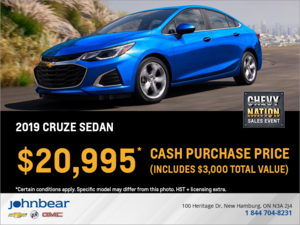 The offer includes $2,650 Cash Delivery Allowance (tax exclusive), $3,850 Finance Cash and $1,325 Dealer-To-Consumer Credit (tax exclusive). Cost of borrowing is $5,810 for a total obligation of $48,625. Freight ($1,895) and air conditioning charge ($100) included. License, insurance, registration, PPSA, applicable taxes and dealer fees not included. Dealers are free to set individual prices. 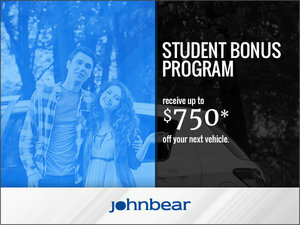 Limited time financing offer which may not be combined with certain other offers. 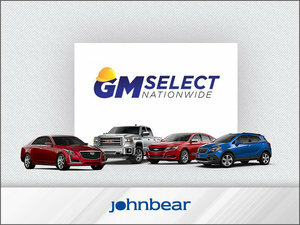 GM Canada may modify, extend or terminate offers in whole or in part at any time without notice. Conditions and limitations apply. See dealer for details. Factory order may be required. ®Registered trademark of The Bank of Nova Scotia. RBC and Royal Bank are registered trademarks of Royal Bank of Canada. 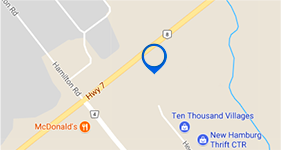 TD Auto Finance is a registered trademark of The Toronto-Dominion Bank.47 Offer available to qualified retail customers in Canada for vehicles purchased and delivered between March 1 and April 1, 2019. Limited time only. 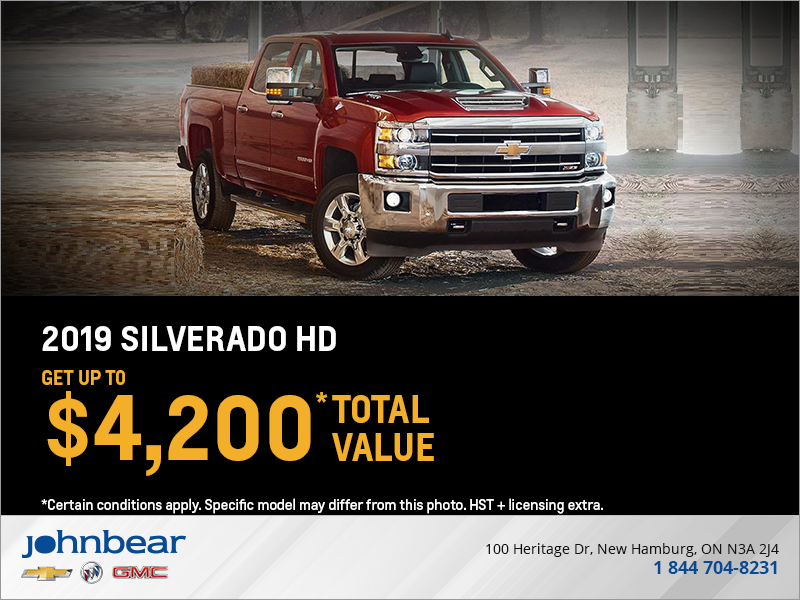 $4,200 Total Value is a combined total credit value for cash purchases on eligible new 2019 Silverado HD Diesel models including $3,200 Cash Delivery Allowance (tax exclusive) and $1,000 Non-Stackable Credit (tax exclusive). Limited time offer which may not be combined with certain other offers. Credits vary by model. Dealers are free to set individual prices. General Motors of Canada Company may modify, extend or terminate offers in whole or in part at any time without notice. Conditions and limitations apply. See dealer for details. 51 Offer available to qualified retail customers in Canada for vehicles purchased and delivered between March 1 and April 1, 2019. 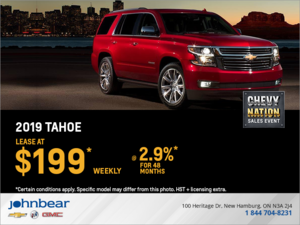 Lease based on suggested retail price of $72,390, includes $900 Cash Delivery Allowance (tax exclusive) and $750 Lease Cash (tax exclusive) towards the lease of an eligible 2019 Tahoe LT RST model. 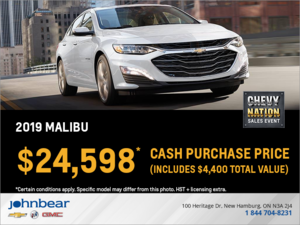 Bi-weekly payment is $399 for 48 months at 2.9% lease rate (2.9% APR) on approved credit to qualified retail customers by GM Financial. Annual kilometer limit of 20,000 km, $0.16 per excess kilometer. $1,900 down payment required. Payment may vary depending on down payment trade. Total obligation is $43,347. Freight ($1,895) and air conditioning charge ($100, if applicable) included. Taxes, license, insurance, registration and applicable fees, levies, duties and, except in Quebec, dealer fees (all of which may vary by dealer and region) are extra. Option to purchase at lease end is $33,299. See dealer for details. Credits vary by model. Dealer may sell for less. Factory order may be required. Limited time offer which may not be combined with certain other offers. General Motors of Canada Company may modify, extend or terminate offers in whole or in part at any time without notice. Conditions and limitations apply. 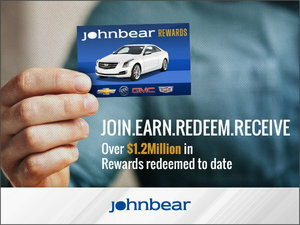 Offers may not be redeemed for cash and may not be combined with certain other consumer incentives. 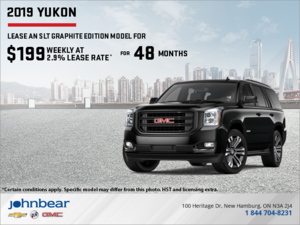 52 Offer available to qualified retail customers in Canada on select vehicles delivered to an authorized GM dealer in Canada from March 1 and April 1, 2019. 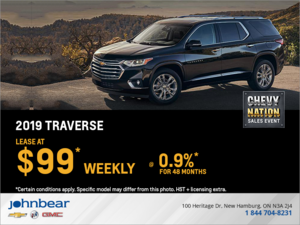 1.99% purchase financing (1.99% APR) offered on approved credit by TD Auto Finance Services, Scotiabank® or RBC Royal Bank for 84 months on eligible new 2019 Suburban models. Participating lenders are subject to change. Rates from other lenders will vary. Down payment, trade and/or security deposit may be required. Monthly payment and cost of borrowing will vary depending on amount borrowed and down payment/trade. Suggested retail price is $75,890. Example: $74,990 financed at 1.99% nominal rate (1.99% APR) equals $957 monthly for 84 months. The offer includes $900 Cash Delivery Allowance. Cost of borrowing is $5,406, for a total obligation of $80,396 Freight ($1,895) and air conditioning charge ($100 if applicable) included. 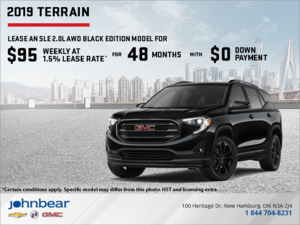 License, insurance, registration, PPSA, applicable taxes and, except in Quebec, dealer fees not included (all of which may vary by dealer and region). Credits vary by model. Dealers are free to set individual prices. Limited time offer which may not be combined with certain other offers. 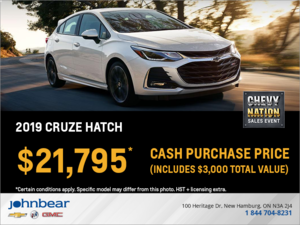 General Motors of Canada Company (GM Canada) may modify, extend or terminate offers for any reason, in whole or in part, at any time, without notice. Conditions and limitations apply. See dealer for details. As part of the transaction, dealer may request documentation and contact GM Canada to verify eligibility. These offers may not be redeemed for cash and may not be combined with certain other consumer incentives. Conditions and limitations apply. Void where prohibited. See Dealer for full program details. ®Registered trademark of The Bank of Nova Scotia. RBC and Royal Bank are registered trademarks of Royal Bank of Canada. TD Auto Finance is a registered trademark of The Toronto-Dominion Bank. 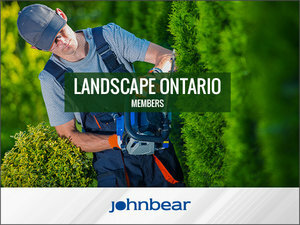 59 To qualify for the Preferred Pricing, you must be a Canadian resident holding a valid driver’s license, have been a Costco member since January 4, 2019 or earlier and must: (1) Register with Costco to receive your non-transferable Authorization Number; (2) Present the Authorization Number to a participating dealer; (3) Retail purchase, finance or lease an eligible new in-stock 2019 Chevrolet: Equinox (excludes LS), Tahoe, Traverse, Trax (excludes LS) and Suburban between March 1 and April 1, 2019. In addition, to receive a $500 Costco Cash Card by e-mail, submit a redemption form to Costco within thirty (30) days of vehicle delivery and complete a Costco member satisfaction survey. Costco will validate your membership at the time of registration and survey completion to determine eligibility. Please allow three weeks for Costco Cash Card delivery, pending completion of all eligibility requirements; including redemption form submission, purchase verification and survey completion. Costco Cash Cards will be emailed to the email address provided to Costco at the time of registration. 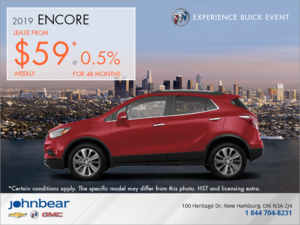 The purchase or lease of a vehicle does not qualify for the calculation of the Costco Executive Membership 2% reward. Not compatible with some other GM Canada incentives. 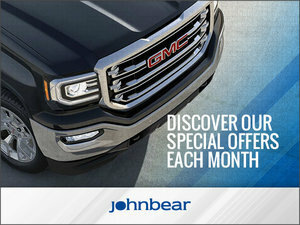 For full program details and for any applicable exclusions see a participating dealer or costcoauto.ca/GM. For Costco Cash Card terms and conditions, visit Costco.ca and search “Cash Card”. ®: Registered trademark of Price Costco International, Inc. used under license. 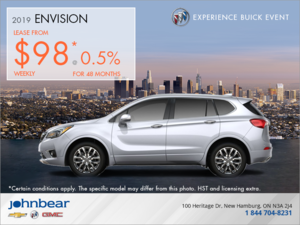 60 Visit onstar.ca for vehicle availability, details and system limitations. Services and connectivity vary by model and conditions as well as geographical and technical restrictions. Requires active connected vehicle services and data plan. Data plans provided by AT&T or its local service provider. Accessory Power must be active to use the Wi-Fi hotspot. 61 Vehicle user interfaces are products of Apple and Google, and their terms and privacy statements apply. Requires compatible smartphone, and data plan rates apply. Apple CarPlay is a trademark of Apple Inc. Siri, iPhone and iTunes are trademarks of Apple Inc., registered in the U.S. and other countries. Android and Android Auto are trademarks of Google Inc.
66 Whichever comes first. Conditions and limitations apply. See dealer for details. 67 Limit of four complimentary Lube-Oil-Filter services in total. 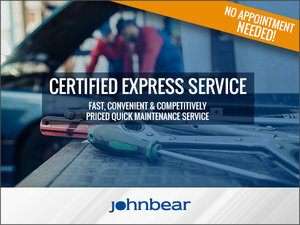 Fluid top-offs, inspections, tire rotations, wheel alignments and balancing, etc. are not covered. Conditions and limitations apply. See dealer for details. 69 MyLink functionality varies by model. Full functionality requires compatible Bluetooth and smartphone, and USB connectivity for some devices. 76 Limitations apply. Not transferable. 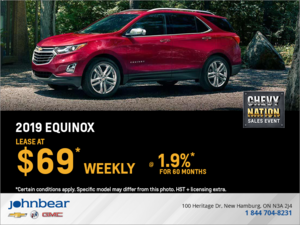 Standard connectivity available to original purchaser for ten years from the vehicle delivery date for model year 2018 and newer Chevrolet, GMC, Buick and Cadillac vehicles. 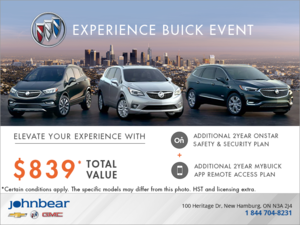 See onstar.ca for details and further plan limitations. Connected Access does not include emergency or security services. Availability of Connected Access and any of its services are dependent on compatible 4G LTE wireless networks and are also subject to change. 77 Services are subject to user terms and limitations. 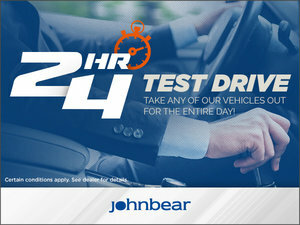 Visit onstar.ca for more details. Data plans offered by AT&T or its local service provider. Availability subject to change. 82 The system wirelessly charges one PMA 1.0, WPG 1.0 and WPC 1.1 (Qi) compatible mobile device. To check for phone or other device compatibility, see www.chevrolettotalconnect.ca. 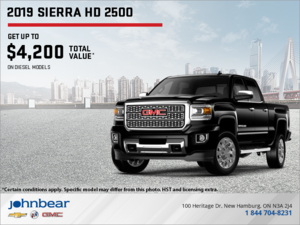 92 Requires Silverado 3500HD Regular Cab 4x4 DRW with fifth-wheel hitch and available Duramax 6.6L V8 Turbo-Diesel engine. Before you buy a vehicle or use it for trailering, carefully review the Trailering section of the Owner’s Manual. The weight of passengers, cargo and options or accessories may reduce the amount you can tow. ^ Safety features are no substitute for the driver’s responsibility to operate the vehicle in a safe manner. The driver should remain attentive to traffic, surroundings and road conditions at all times. Read the vehicle Owner’s Manual for important feature limitations and information. While we try to ensure accuracy, we reserve the right to correct any errors in pricing or descriptions, and to cancel or refuse to accept a purchase based on an incorrect price or description listed online. TRADEMARKS: The marks appearing on this page including, but not limited to, General Motors, GM, Chevrolet, the Chevrolet emblem, Silverado and their respective logos, emblems, slogans and vehicle model names and body designs; and other marks such as Active Fuel Management, Autotrac, Duralife, Find New Roads, IntelliBeam, myChevrolet, MyLink, OnStar, the OnStar emblem and StabiliTrak are trademarks of General Motors LLC and/or General Motors of Canada Company, its subsidiaries, affiliates or licensors. Apple, iPad, iPhone, iPod, iTunes and Siri are trademarks of Apple Inc., registered in the U.S. and other countries. Wi-Fi is a registered trademark of Wi-Fi Alliance. Android and Android Auto are trademarks of Google Inc. All rights reserved. 94 Before you buy a vehicle or use it for trailering, carefully review the Trailering section of the Owner’s Manual. The weight of passengers, cargo and options or accessories may reduce the amount you can tow. 93 Silverado 3500HD Regular Cab 2WD DRW with Vortec 6.0L V8 engine. Maximum payload ratings are intended for comparison purposes only. Before you buy a vehicle or use it to haul people or cargo, carefully review the Vehicle Loading section of the Owner’s Manual and check the carrying capacity of your specific vehicle on the label on the inside of the driver door jamb.